Do not reuse CSC (Concentric Slave Cylinder). Because CSC slides back to the original position every time when removing transaxle assembly. At this timing, dust on the sliding parts may damage a seal of CSC and may cause clutch fluid leakage. Refer to CL-16, "Removal and Installation". Do not reuse transaxle gear oil, once it has been drained. Check oil level or replace gear oil with vehicle on level surface. During removal or installation, keep inside of transaxle clear of dust or dirt. Check for the correct installation status prior to removal or disassembly. 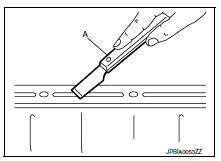 If matching marks are required, be certain they never interfere with the function of the parts they are applied. 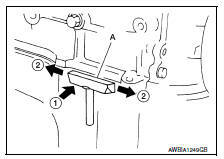 In principle, tighten bolts or nuts gradually in several steps working diagonally from inside to outside. Do not damage sliding surfaces and mating surfaces.